“Ciudad del paraíso” the paradise city. This is how the Nobel Prize winner for literature, Vicente Aleixandre, described Málaga. A city that vibrates with life and fascinates with its mixture of ancient history, folklore and modern culture. And of course, it is easy to imagine paradise in this harbour city with nearly 3,000 hours of sunshine a year and several kilometres of beach right in the centre. Sadly many visitors to the coast never visit the city itself. They land at the airport, dash off to Fuengirola and return to the airport a few days or weeks later – without once having visited the city! 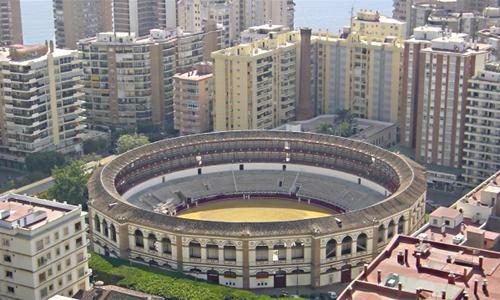 Málaga has accommodation at all price levels and all standards. You can choose from city centre, beach or airport hotels. There are no 4 or 5 star hotels at the airport so if this is the type of accommodation you require you will have to leave the airport. There is, however, a Parador some 3kms away at the golf course. All major booking engines will be full of special offers and AirBNB will also have many choices. Buses from Málaga bus station at Paseo de los Tilos go to, for example, Marbella, Estepona, Granada, Córdoba, Ronda, Madrid and Seville. Departure times can be found here. Please note this site is by no means comprehensive! The reason is that the bus station serves dozens of different bus companies and some are better than others at updating their information. The main train station is right next door. It is rather splendidly called Estación Málaga – Marí­a Zambrano (after a local writer). Trains depart to Sevilla, Córdoba, Madrid and Barcelona among others. Departure times here. Suburban (“local”) trains which run between Málaga and Fuengirola (C1) and Álora (C2) leave from both the main station and at other stops in the centre. The terminus station is Alameda and is in a subway next to the post office on Avenida Principal. Tickets MUST be bought in advance. The pharmacies are usually open from 10.00-20.30 with a siesta from 13.30-17.00. Farmacia Reding, Paseo De Reding 17 (opposite the bullring on Plaza de Toros), is one of the pharmacies that are open 24 hours a day, Tel: +34 952 223 731. Alcazaba and Gibralfaro are military forts dating from the period of Arab rule. There is a palace inside the walls with a beautiful garden and spectacular views. The Roman theatre just beneath was built during the first century A.D. and has recently been restored and renovated after many years of neglect. Málaga cathedral was built between 1500-1700 on the site once occupied by the Aljama Mosque. Renaissance style with a Baroque main façade and décor. This beautiful museum from the 16th-century Buenavista Palace is a must for all visitors to Málaga, young and old. Thanks to the grand-master’s daughter-in-law, Christine, and grandchild Bernard, the museum boasts a collection of nearly 200 works of art. Just a stone-throw away, at Plaza de la Merced, the house where Picasso was born, is also open to the public. The affluent couple Jorge Loring and Amalia Heredia created this fantastic garden around their Hacienda La Concepción in the 19th-century. 30,000 square meters with 500 tropical plants. Arab baths in a cosy, relaxing environment in the centre of Málaga’s old town, near Plaza de la Merced.